One by one, cat after cat came out of its carrier with a vet standing by to examine and hand out much-needed vaccines. The rush of activity at Meriden Humane Society (MHS) took place after the owner of the cats called Wednesday afternoon to surrender the animals. "It was shocking, I mean, to see 20 carriers stacked up in the back of a car," MHS Vice President Alysia Robinson said. Robinson said the man who came with an SUV full of carriers said he'd recently become homeless in Bristol and was living out of his car with 20 cats, his father, his aunt and a dog. "He could barely speak. He's had some of these cats for ten years. This is not - this wasn't, 'I collected all these animals and now I'm dumping them.' It was genuine. It was heart-wrenching for them," said Robinson. Robinson said they took in seven male and 13 female felines, many of them appeared to be related to one another. The MHS vice president said emotions ran even higher when she begged the family to also surrender their pitbull mix named Lala. "It got to the point of where I was crying because all I was thinking is that we have a cold snap coming and this family is staying in their vehicle with their dog because it was just too much to think about letting their dog go," said Robinson. Robinson said the owner rescued Lala from an abuse situation and she promised to help and foster the dog until the family could get back on their feet. She said Lala has possible skin issues, overgrown nails and what appears to be a tumor on her head. As for the cats, many received a much needed bath Wednesday night. A vet said they're very thin and some have medical issues like upper respiratory infections and skin conditions. Workers said when they gave the cats food, the animals scarfed it down. Getting each animal fixed, vaccinated, and microchipped will cost around $120, Robinson said. The shelter asked for help via social media and said in two hours they managed to raise about $650. She said they still need more monetary donations as well as donations of canned cat food. She said they're also looking for people who can help foster. 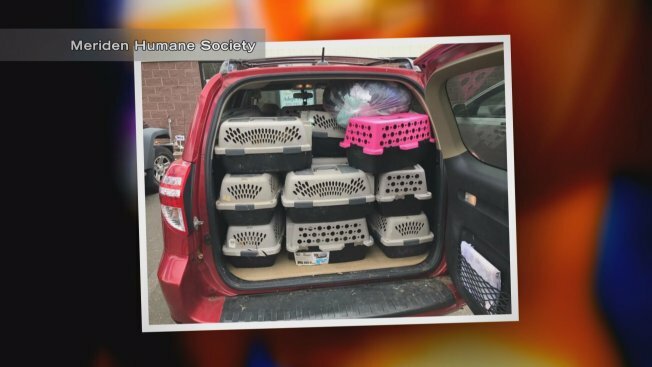 As the shelter looks for help handling the influx of animals, they hope the work they're doing helps the family who had to let them go. "We're hoping this gives them the opportunity to get into a shelter, and hopefully the shelter is able to help them stabilize and get them in a house and somewhere to live," said Robinson. "We've all been in situations where we've needed help." MHS said they hope to be able to give some of the cats to other rescues and are looking to put the cats up for adoption within the next couple of weeks. Information on how to donate can be found here.